Our hospital has a lot of little charity shops that sell snacks - some more hidden than others. One of my favourites has a tendency to grab a few unusual things that I can pick up. It's here that the Burts Lentil waves came from. 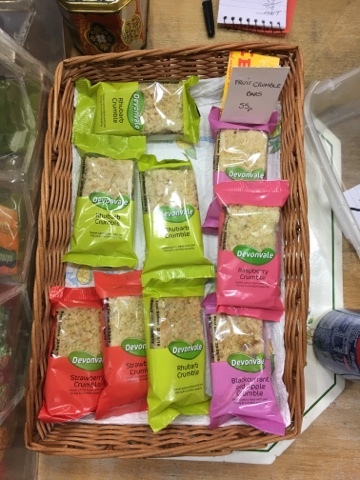 This time they had a range of Devonvale fruit crumble bars which I hadn't seen before so I decided to try. I went for rhubarb as it would be my first choice of a real crumble. I don't think it made a massive difference to the flavour - maybe a hint of ginger in the sweetness - as the crumble itself was the main flavour. And boy did the top crumble. It went everywhere! Not great for eating at your desk, and the local pigeons will love you if you eat this outside. The base was a little more stable and helped but every bite was a shower of crumbs. That said - for 55p it did the job and I'll probably try more in the range. My Friday lunchtime Pepsi and a chat routine usually involves a luscious dark choc bounty, but while these are about I may have a few.